With strong global growth, increasing levels of consumer mistrust and increased scrutiny of supply chains, maintaining the integrity of organic presents an ongoing challenge. What can organic businesses, certifiers and their partners do together to ensure confidence in organic is maintained? With strong growth in organic markets across the globe comes the increasing challenge of maintaining the integrity of organic products. What are the threats and what tools or approaches might be available to businesses, to support better control of integrity in future, maintaining confidence in organic in a climate of increasing scrutiny of both the organic sector and certification? Giles Chapman kicked off by addressing the importance of food trust and the damage from breaking it. He gave the example of Melamine contamination in milk bottles: 6 deaths, 300 ill health effects, 2 death sentences. He highlighted not only damage to consumers (e.g. health, breaking religious rules) but to country's reputations. Organic, as a high value good, is perhaps particularly appealing to fraudsters. Frank Gerriets outlined how IT comprehension of business managers offers a significant source of vulnerability. Check Organic is one of few organic-specific solutions; it tracks transactions in supply chain alongside steps in certifiers’ chain (hectares grown, expected yields etc.). Already implemented on obligatory basis in Italy. Ronald van Marlen highlighted how organic trades on trust; it doesn’t just not use pesticides because it’s not allowed, but also there’s an expectation that we should be trying to meet the 4 IFOAM principles. Alison Johnston rounded up by identifying how testing isn’t enough on its own. There is no test for organic, only indicators of consistency (pesticide residues, GMOs etc.). Testing is really important – deterrent and detecting – but on its own is not enough. Organic can be particularly appealing to fraudsters. However, it is also particularly vulnerable to the consequences of broken trust, being built on trust, principles and values. Poor IT comprehension represents a key area of vulnerability for businesses. Tools that track supply chains and match supply chain transactions to certifier data can help, but paper tracking of physical goods can never be enough on its own when the paper is intrinsically separate to the goods it is tracking. The question was raised as to how organic farmers who farm on those principles and values can tell their story in a supply chain where other suppliers farm just to meet test criteria (e.g. pesticide free) and all are sold under the same retailer own brand label. Testing and traceability is not without problem. Where recalls may happen years later – as is the case with processed goods – small farmers cannot afford to carry the risk of being reprimanded years later for contamination, for example. Can exclude small farmers from high-risk (condensed, freeze dried, …) products. We need a combined suite of detection, deterrent and other actions to ensure food integrity. We must NOT assume that testing on its own can be a solution. Even where testing is used, random, variable and therefore unpredictable is the only way that works. The way we trade and the relationships we form between businesses can significantly influence the products we bring to market. How could the structure of supply chains change to better inform participants of the roles and actions of others, and how can we encourage better information flows, strengthening integrity and ultimately supporting further market growth? 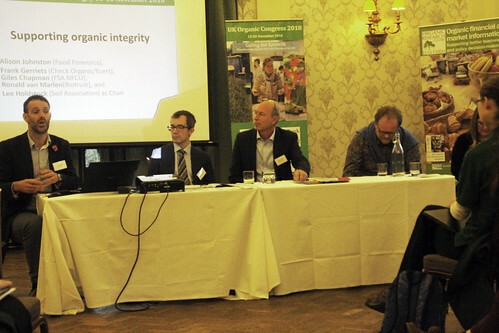 The introduction by Andrew Trump highlighted the fact that the integrity of the organic sector has recently been ‘scrutinised’ by organic supporters including some organic NGOs. The talk given by Suranga Herath (CEO at English Tea Shop CEO) was focused on the wide range of initiatives designed by English Tea Shop to improve the livelihoods of small farmers and employees in Sri Lanka, the Love Care Change programme to educate and train staff and also to help them through self-help programmes. Ronald Van Marlen (Director at Toppas Organic) during his presentation on Toppas initiative in Serbia highlighted that organic food is not only about regulatory prescriptions, but includes also a set of principles addressing social and externalities issues. The unexpected growth of the organic sector requires the need to bridge together this set of principles and values with the value creation as interpreted by the market.